Too Much Sugar, Not Enough Writing: 'Absolute Visions,' on sale now! I'm part of a fantastic writers' forum called Absolute Write. AW is packed with talented writers, so when forum owner MacAllister Stone announced that she was putting together a speculative fiction anthology there were plenty of submissions, including mine. I sent in a personal favourite: a short sci-fi story called 'The Machine that Loved Alan Turing.' It's kind of a personal one for me, which sounds weird since it's a dystopia story about a robot in love with a long dead historical figure, but hey man, I can relate. I really love this story, but I was starting to worry that I was the only one: it had been rejected seven times before I subbed it to the AW anthology. But then...accepted! My story was one of the 19 that made it into the book. I'm humbled not only to have made it into the anthology, but to have my name alongside writers that I admire such as Suzanne Palmer and K.L. Townsend. 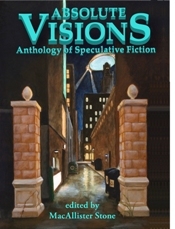 I have yet to read the other stories in the anthology, but I am still sure of their quality. It's really amazing to have something of mine show up when I type in my name on Amazon. Right now the hardcopy of the book is for sale for $9.99 on here. A kindle version should be up soon, but for now I can't wait to have the real thing here in my hands. Anyway, in case I'm not being subtle enough: Buy this book! It's full of work by both talented writers and illustrators (did I mention there's illustrations?). Support not only the artists but a great forum.